1934 Maine Spring Inspection Sticker - $20.00 : Bob Hoyts Classic Inspection Stickers, Add a Final Touch to your Restoration! 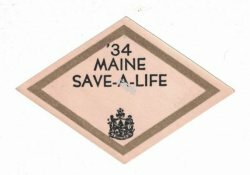 This 1934 Maine SPRING Inspection sticker was issued in late 1933 or early 1934 and expired in the fall of 1934. Maine reportedly began six month inspections in 1934. It has been restored and reproduced to perfectly match the original in size and color . This sticker was blank in back. It has our patented "Peel and Stick" feature that allows attaching to the inside windshield.